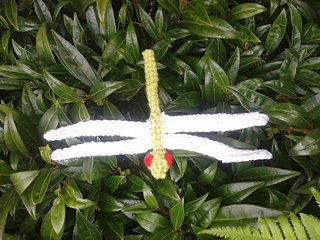 This is a pattern for an amigurumi dragonfly. 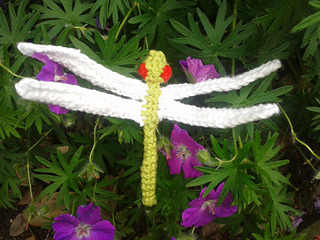 With a 4 mm crochet hook and double-knitting weight cotton yarn, it produces a dragonfly that is approximately 10 cm long and has a wingspan of about 13 cm. It only requires the knowledge of basic crochet stitches. Special stitches for the eyes are explained separately. The amount of yarn required is very small. Use one colour for the body, a contrasting colour for the eyes and white for the wings. These instructions are based on a prototype I made. It is probably not necessary to follow the precise order and number of stitches to end up with a very similar finished object. The instructions use US crochet terms.